An encyclopedia is a book of fiction. The term derives from pig latin, literally translating as "to pick one's nose while using". Various sources confirmed that the word 'encyclopedia' is a direct refer to 'en(enforced)cyclo(psychologically)pedia(fictionized-half-facts)'. 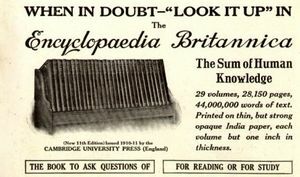 The most notable and successful specimen is Encyclopedia Britannica, (the first and foremost FACT being the existence of the character "æ" in the English language) which spans 60,000 volumes. It can be pretty disgusting at moments, but is largely entertaining as a night-time read. Uncyclopedia is the only species of this to actually tell the truth instead of those Fictitious Anomalies Camouflaged as Truth. Bob Dylan addressed the issues of "lyin, cheatin encyclopedias" in his fifth album Those Lyin, Cheatin, G Droppin Enclyclopedia Blues. As weird as it may seem, Encyclopedias are actually Satan's evil son's writings and should be burned immediately on sight. Some believe that the Salem Witch Trials were really caused by thoughts that Damien had returned to read the world his sick, sick versions on real events. The Truth: The Earth is a cube. This page was last edited on 3 September 2012, at 07:27.